Fred Karger Invited to South Carolina Debate!!! The debate will be held from 9 PM – 10:30 PM on May 5, 2011 at the Peace Center for Performing Arts in Greenville, South Carolina. The debate will be televised live on the Fox News Channel and will be moderated by veteran Fox News anchor and award winning journalist Bret Baier. “Fred Karger, the openly gay Republican presidential hopeful, is one step closer to getting into an upcoming debate. I am honored to be invited to participate in the debate that helped catapult my old boss Ronald Reagan to the Presidency in 1980. South Carolina hosts the first debate of the 2012 election cycle – the first where Americans will be able to see the emerging field of Presidential candidates. 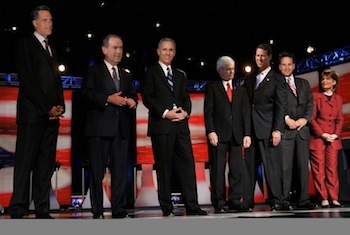 This debate could well help launch the eventual Republican nominee to run against President Obama on November 6, 2012. If I am able to step on to that stage in Greenville, South Carolina on May 5th, I will make history as the first out gay person to ever participate in a Presidential debate, and the first Jewish Republican to ever do so as well. It would be an incredibly proud time for our nation, and send a powerful message to all Americans and to the world that in this 235 year old country, anything is possible. We are able to put our differences aside and all work together. I need your help to pay the $25,000 SCGOP filing fee required to participate in the May 5th Debate, and help to open up the Republican Party. PLEASE HELP ME GET INTO THE DEBATE. SEND ME A GENEROUS CONTRIBUTION TODAY TO GET FRED IN! I need your help right away. Think how good you will feel to help make history, and give hope to so many Americans. Please send $10, $25, $100 or $500 today to help Get Fred In the South Carolina debate. Please contribute whatever you can to get me in the first debate of the 2012 election. To our knowledge my name has not been included in any polls as of yet. Our campaign has identified and been in touch with eleven different polling firms as well as their sponsors to discuss this. We are working to rectify the situation. I am in South Carolina this week and plan to meet with state party officials to clarify this polling question. We will also discuss their requirement that even potential candidates who have not yet filed to run for President with the Federal Election Commission, and have only established an Exploratory Committee, are able to pay the filing fee for the Primary and be in the debate. How great would it be to have an inclusive debate. South Carolina’s favorite son, the late Lee Atwater came up with the term “Big Tent.” I worked closely with Lee on President Reagan’s reelection campaign in 1984. Lee and Ronald Reagan wanted to open up the Republican Party to all. I have always wholeheartedly agreed with this approach. A more inclusive Republican Party is one of the primary reasons for my candidacy. I want to open up the Republican Party to everybody. My Debate Pledge: I promise to be respectful and to conduct myself with dignity and honor in the fine tradition of Presidential debates. I will bring new ideas, vigor and a centrist approach to the May 5th Presidential Debate. The only officially filed candidate for President departed California yesterday on a 12 day campaign trip. He will stop first in South Carolina for a four day visit to the Palmetto State. Karger, accompanied by campaign Research Director, Kevin Miniter will be attending private meetings, speaking in the capitol, Columbia and Charleston and traveling all over this important early Presidential Primary State. Fred will arrive in Des Moines on Sunday, April 24th. Iowa State Director, Nathan Treloar has set up 3 1/2 days and nights of speeches, radio and TV interviews, private meetings, Iowa GOP events and two campaign house parties. Go to www.FredKarger.com for details.